I came, I saw, I made a mess of it! Getting to Seville had proved a challenge with ongoing injuries since December, first a foot injury put me out for 3 weeks and then I pulled my back, which delayed me further. Along with this two of my dearest running friends had recently become parents and had consequently had to drop out of the marathon. It had been an interesting couple of months to say the least! However I boarded the plane with a positive mindset and hoped for the best. We arrived safely and I soon headed off to the expo to collect my number with ease. It was a fairly small expo and the numbers for the marathon were maxed out at 14,000 runners, small compared with London's 40,000! 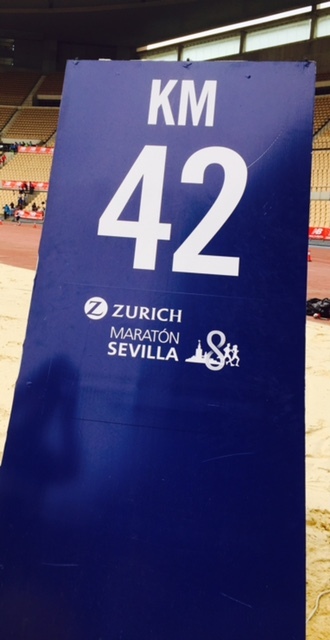 With my number in hand, on Friday all I had do was sit chill, fuel, hydrate and wait until Sunday for the race! A dark and chilly wait at the start line. The morning arrived and myself and maybe 50 other marathoners squeezed onto a courtesy bus near our apartment and arrived in the cold darkness of the Olympic stadium at 8am. It was chilly but, no rain as yet and no nerves, which I’m not sure if that's a good sign or not these days? My pen was the 4:30 pace and I was happy I would achieve this, or better this. 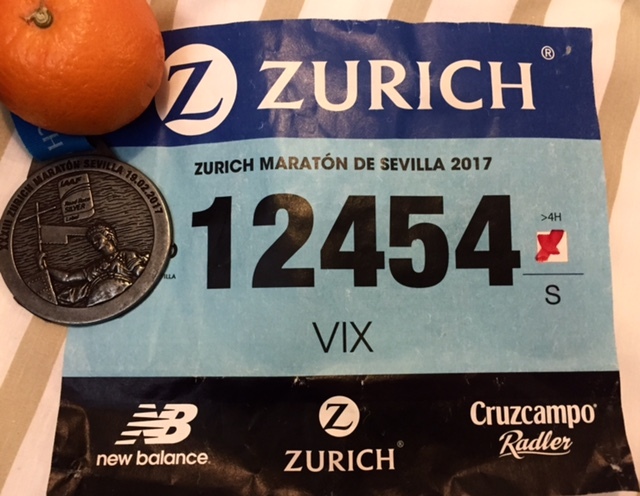 I mean it was the flattest and fastest marathon in Europe so I had something to prove! I said goodbye to my Cazzie and the crowds cheered me over the start line. It was spring like weather, not hot at all and thankfully no rain appeared, as it had threatened. Within minutes I got into my stride and smiled, I always love the excitement at the start, It feels like my first marathon, buzzing and daunting at the same time. I’d got to the start line and now the rest was up to me and the whole city was ahead for me to explore. I passed the Gold Tower and headed up past the Bullring with the river on my left, sporadic supporters along the roadside and at least one band to help me run to the beat. I passed Caz by a bridge and felt happy that all was going to plan. I needed the loo but, I knew there was toilets everywhere so felt contented to hold on rather than reenact my shewee incident from the Race to the Stones event last summer! However, 10km in and no sign of a Portaloo? So I kept going, stopping at 12km to find two loos They were something akin to the toilets in Train spotting, but I was desperate so I held my breath and managed to squat and wee all at the same time! Anyway, the route was well supported in some areas and not much in others, it was deadpan flat and by 15km I was feeling tired. I struggled to get to the halfway point and by 25km I was texting Caz for help! I had been fuelling well, but I had a feeling my electrolytes weren't right, but by now it was probably too late! What to do??? I spent most of my time needing the loo! At the next water stop I grabbed 2 cups of water and put the rest of my tailwind powder in and then drank another 2 cups whilst walking. I ran to 30km where Caz met me, I wrestled her cheetos crisps off her and drank more electrolytes to see if it might help me perk up a bit. All the toilets promised on the route map never actually appeared and so I stopped to pee in a bush near the Royal park! Caz told me to keep going and she'd meet me in the park. So I just kept trying to put one foot in front of the other, ticking off each km, we met up again and she started to walk with me and encouraged me to run a little to get to 35km. I was finished, I was dead, but Caz pushed me on through the centre of town which was really well supported, so many people shouting “Vamo, vamo”(let's go) and “Animo” (cheer up), it lifted my spirits and so I tried push on. Another toilet stop in Burger King occurred, but then I couldn't get my head around the fact that I only had 5km to go, just 1 parkrun back Olympic stadium and the finish line. Eventually I started to believe I could finish and thankfully Caz ran the last 2 km by my side, which made me feel better! The last 500m was through a tunnel and onto the track, amazingly I found enough energy to give one last kick over the finish line! I was so relieved!! No tears were shed, just sheer relief as I flung my arms up to the sky and thanked my lucky stars that I made it through another 42km! I collected my medal, although Caz had earned at least half of it, and soon after many photos I was ushered through more tunnels for refreshments, beer, water, fruit, a goody bag, more beer and to be reunited with Caz. I so happy to see her, I gave her my beer and showed off the medal, as we walked back into Seville we cheered in the last of the runners, not so long ago I had looked like them, beaten and tired. I hobbled back to the apartment, encountered stairs and just flopped on the bed, exhausted and hungry but content with my achievement. So thankful to have made it over the finish line. In retrospect, I really made a meal of the Seville marathon, signing up to a fast flat road race was not my brightest idea, but the lure of a holiday and running abroad in February had won me over. The key to running all my marathons is never to give up, keep pushing and remember how much you want it, it doesn’t get any easier but I have a few coping strategies that keep my legs going and my mind free of mental chatter. Counting from 1 up to 300, turns the brain off - repeat as necessary. Note on your arm where your supporters will be. All of these help when things start to go a bit pear shaped, but sometimes just overlooking the basics, ie - not putting enough electrolyte mix in my water can be the difference between a good race and a bad race. Note to self, practice fueling more with new product and suit training terrain to marathon day course! Nothing new there, but it’s incredible what you forget, even when you completed a few there is always something new to learn! Marathon number 17 in the bag. Thanks for reading my blog, next event Ranscombe trail marathon 8th April and then I’m heading to London, for my 20th marathon. As part of my 50 marathon challenge, next month I will be running my 20th at the London marathon and supporting The Alzheimer's Society. If you wish to support please click the link below.